The 72 in. Ledgetop Counter is a great addition to any counter, mix and match it with the entire line of fully modular units for a complete counter to fit your store`s needs. The Ledgetop Counter has a 22 in. D recessed ledge to hold register. 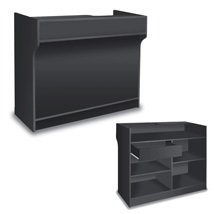 Inner countertop features cable holes for PCs and POS devices. Inside of the counter has shelves and a drawer for extra storage.